The "Getting Started" page on Mozilla.com is one of our most viewed Web pages, with an average of 525K page views per day (following the download.html page and what's new page). According to Ken Kovash's Blog of Metrics post from February of last year, more than 90% of traffic to this page comes from the embedded link in the bookmark toolbar that we've pre-loaded onto every version of Firefox. The remaining 10% of visitors seem to come from a link on the First Run Page. 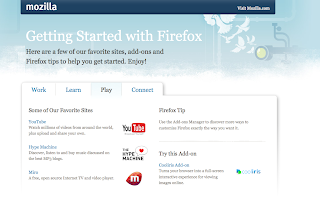 1) The Getting Started Page is one of the biggest touch points we have, inside or outside of Mozilla.com. 2) A lot of our users are looking for specific content on the Getting Started page. 3) Most of those users aren't finding whatever they are looking for. - Kill the Getting Started page. I just don't think this is a viable option. We have so few touch points with our current users as it is. Outside of Mozilla.com, we have access to the snippets on the Google Start page, the First Run page, the What's New page, the Getting Started page and our social media outlets (Twitter and Facebook). I agree that we can't leave the page the way it is, but getting rid of the page doesn't solve the problem. If anything, it makes the problem much worse by leaving us with one less channel to communicate. We could definitely look into renaming this page and calling it something else...like maybe the "Firefox Connect" page. The only problem is that we still don't know what kind of content these 500K users are looking for. Obviously, the "Getting Started" title resounds with some of these users, or else, they wouldn't be clicking on it. My theory is that they hit the page expecting to find information about using Firefox features or setting up Firefox and stumble on a page in which we recommend certain websites or tools. Users must be looking for something to do with "Getting Started" and re-branding the page on a whim without knowing what people are looking for will lead us right back into the situation we're in now. I think this is by far the best option. This entails creating new content for a variety of audiences, and testing them on a percentage of the population to see what content these users are looking for. The design that has the lowest bounce rate will give us insight into what kind of content these users are looking for. One idea I have is testing the content found on the First Run page. 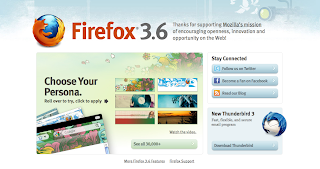 As it is now, people get to the First Run page immediately after downloading Firefox for the first time. Going from my own experience, people are not very patient after downloading an application or program from the Internet. It's all about clicking through the introductory tabs and information and getting to the actual usage of the product. And once they realize they don't understand something or they get confused, then they look for more information. And this is where everything gets *interesting*. As things stand now, the First Run page is not a page that you can navigate to unless you know the exact url. We don't promote it anywhere. It's just the page that comes up right after download. So what happens if you're impatient and just want to start playing with the product after downloading? You lose the opportunity to explore the content on this page. And even if one of our users decide to explore some of the content on this page and say, decide to be a Facebook fan, they have no way to return back to the First Run page. Once you leave the page, that's it. Finito. Game over. So what makes the most sense to me is to at least try putting this content on the Getting Started page. More than that, we also have to promote the page to all of our New Users and how to find the page. Doing so will give this page the best opportunity to offer all of our users a place to go to find out the basics about Firefox in a consumer friendly, visual way. We definitely need to get the testing process started as soon as possible. Please feel free to let me know if you have other ideas for content testing. 2) The GS page, as it stands, is not offering people the content they want. 4) The First Run page design, within the site, not in layout, is broken. As is the What's New page. Neither are easy to find/navigate to and although the information they offer is useful, we need to find a permanent place for people to find this information, preferably, within the product. People should be able to find this information whenever they want it, not just immediately after upgrading or downloading. 5) Maybe we can put the content of the First Run page on the Getting Started page? Maybe we can find other content that will please our users? Feel free to contact me at lmesa@mozilla.com if you have any other ideas or suggestions. What would you like to see on the Getting Started page? How about a nice Google search box that says "Can't find what you're looking for?" And get some metrics from that. That way users will tell you exactly what they're looking for. In other words, a Google branded Mozilla page instead of a Mozilla branded Google page. I think your on to something, because even though I go to Get Started, i don't care about that stuff most of the time as an experienced user. The content also never changes, and you can never get to Whats' new page like you said either by link or by Help. GS content are just things to do on the internet, and they are not related to the firefox product. Instead I would want to know about several other things like whats new, release notes, add-ons, extentions, themes. How to customize firefox..
You could put a link to whats new in the Help section, or put the release notes in About:Firefox screen or put the what new content on the release notes page. All those things would be good steps to take. Its a great post and I hope you get more ideas, because Getting Started is like Internet for Dummies and not about the product, which should be instead. The current content on Getting Started might just be a sub section of a new page which focus's more about how to use and customize the product and release notes. I think release notes should be tucked away into the about product page.. and change the help item to point to getting started with firefox and drop the bookmark. Basically a new page that covers all the whats new, release notes, how to get add ons, how to get to the support site, how to get back to download new firefox version, and to check out other things: like Miro and You Tube, etc.. I hope It makes sense. It would compliment your thoughts about the user's habits that you mentioned. Focus on a consolidation dashboard for how to learn about and get the most of the product. It flows with the idea of looking for more information..
One datapoint from a while back when we had external testers on l10n builds was "There are no bookmarks to the internet". "Getting Started" is really that, "now that I have that browser, what do I do with it?" I don't think that making that thing less focused helps. A note on the data from the firstrun experiments, I don't think that the two pages were apples-to-apples. The old one was visually laid back, with content hidden somewhere in the corner, IIRC. The new one has the HUGE COLORFUL button to personas. I don't think the experiment really says anything about the content that page linked to, but much about how it linked there. Perhaps we could try something similar? Did you what Apple did with their product pages? They put dozens of videos online on how to use them. People are already familiar with video online and just need to sit back and watch to learn new things about their apps. I know I love it. Maybe we could offer our users a similar "after-sales-support"
I think you've got a great idea. The first start up page is really full of useful stuff, but I have never used the "Getting Started" page for anything. It would be a great place to introduce new users to things like Personnas, Addons, and the Mozilla community. It could include the Personnas chooser from the first time startup page, perhaps a list of recommended addons with links to more, and a link to the wiki. I think youve got a very good idea about changing the Getting Started page. An idea I have would be to put a collection of links right into the Navigation Toolbar! One isnt able to find the Firefox Support page unless they click on help first, and notice the link on that page. To me support would relate more to problems one is having and fixes, how too's etc. Not so much add-ons, or different products Firefox makes. and theres alot of good things in communites that I think should be right up front with a link in the Nav Toolbar. You know how men dont like asking for help, so whats the odds they will click on help to find all of these links? Well, thats my two cents worth!! Nice post! Thanks and keep on sharing! Great topic.I have found this article absolutely fantastic.Mozilla has brought a lot of facilities to the internet world I I like to use it .It is my favorite browser.